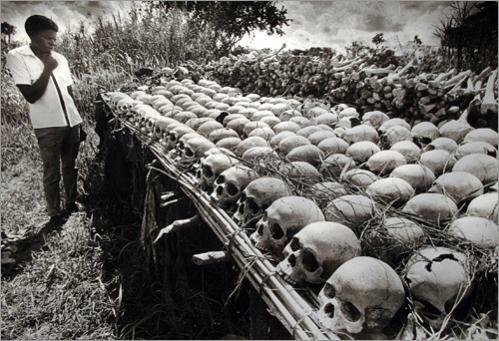 Some of the victims of the Idi Amin regime recovered by local farmers in the fertile fields of the Luwero Triangle region north of the Ugandan capital of Kampala in 1987. March 22, 2012 -- Links International Journal of Socialist Renewal -- The reception in Uganda to the KONY 2012 viral video has been unanimously negative. From journalists, academics and bloggers to local NGO workers and local people at a public screening in the northern town of Lira, Ugandans have reacted angrily to their country’s politics and problems being simplified into a childish narrative to serve foreign propaganda needs. Many Ugandan commentators noted that this is not the first time Uganda has suffered this treatment from Western filmmakers, citing the highly successful, award-winning 2007 British film, The Last King of Scotland, as another example. This film is centres on Idi Amin Dada, who ruled Uganda from 1971 to 1979 in a violent reign of terror that cost 100,000 lives. The Last King of Scotland basically revived for a new generation what was already a standard narrative. Amin’s outlandish statements, absurd self-aggrandisement (awarding himself titles such as “Conqueror of the British Empire”) and the fact that while most dictators are content to employ others to kill and torture he took a more hands-on approach, made him the archetype of the post-colonial dictator. Underlying this narrative is racism and post-facto justification of colonialism: the implication being that if you allow Africans to rule African nations, this is what they do. However, as the article below by Pat Hutton and Jonathan Bloch, originally written in 1979, adapted for Zed Press in 1980 as part of the book, Dirty Work 2—The CIA in Africa, and republished in the February 2001 New African, clearly demonstrates, Amin was installed and maintained in power by Western powers. While the article focuses on the British role, British government documents declassified in 2002 suggest that while Britain welcomed Amin’s coup and immediately supported the new régime, London was initially taken by surprise, the coup having been carried out by Israel. Amin had risen to the top of the Ugandan military as an ally of President Milton Obote. However, their subsequent falling out had led to Obote planning to move against Amin, endangering Israel’s operations, which was the motive of the coup. In 1972, the Addis Ababa Agreement led to a temporary cessation in the conflict between the South Sudanese rebels and the Sudanese state. This caused Israel to lose interest in Amin and become unresponsive to his ever-increasing demands for military hardware. In response Amin expelled Israeli military advisors and turned to the regime of Muammar Gadaffi in Libya for support. Relations between Amin and Israel worsened in 1978, following the hijacking of an Air France airliner on a Tel Aviv to Paris flight to Entebbe Airport in Uganda. Amin claimed to be playing the role of negotiator but the Israelis suspected him of siding with the hijackers and launched a dramatic military rescue. Whatever the truth, once again the narrative was hijacked by Western movie makers. While Britain and Uganda broke diplomatic relations in 1976, as the article below explains covert British support for Amin continued until his overthrow with the help of Tanzanian forces in 1979. Uganda’s nightmare did not end with the overthrow of Amin. In the ensuing civil war, which lasted until 1986, 500,000 people were killed. The worst atrocities occurred during Obote’s second presidency, which lasted from 1981 to 1986. It was out of this war, known as the Bush War, that both the current Ugandan government of Yoweri Museveni and Joseph Kony’s Lords Resistance Army emerged. It is against this record of Western indifference to the Ugandan people that naïve calls for Western military help to “save” Ugandans should be judged. That Idi Amin was a brutal dictator of extraordinary cruelty is well known and becomes more so as the tally of his victims, according to conventional accounts, topped over 100,000 between 1971-75. What is less known is the role of the British government and its allies not only in maintaining Amin's machinery of repression but in actually establishing him in power. Although Amin later became alienated from his Western friends, we can show here that the break between him and Britain became complete only when his fall (on April 10, 1979) was imminent, and that regarding him as the least evil option from the point of view of British interests, London actively helped keep him in power. Unease about Obote's intentions was combined with attempts by outside interests to ingratiate themselves. Obote accepted aid from the Israel government, which was desperately trying to avoid total diplomatic isolation while being used as a proxy by the United States in countries where its own reputation was tarnished. The Americans and Israelis worked in very close co-operation in Uganda, particularly through their respective intelligence agencies, the CIA and Mossad. Washington provided some development aid while Israeli troops trained the Ugandan army and airforce. The British economic and political presence was always predominant and this was one of the situations that Obote hoped to change. Throughout the late 1960s, Obote was consolidating his personal power and introducing legislation that was to shake the colonial interests. Although Obote was no Fidel Castro or Julius Nyerere [president ofTanzania], his Common Man's Charter and the nationalisation of 80 British companies were not welcome in London. As one prominent commentator put it: The Obote government was on the point of changing not only the constitution but the whole political system when [Amin's] coup occurred. A vital source of raw materials, Uganda was not about to be permitted to determine its own political development at the expense of the entrenched interests. Soon, plans were being laid by Britain in combination with Israel and America to remedy this situation. The first task was to choose Obote's possible successor, and Idi Amin proved an obvious choice. Known by the British as a little short on the grey matter though intensely loyal to Britain , his qualifications were superb. He had started his career as a non-commissioned officer in the British colonial regiment, the King's African Rifles, and later served in the British suppression of Kenyan nationalists in the late 1950s (mistakenly known as the Mau Mau rebellion). In Uganda itself, Amin had helped form the General Service Units (the political police) and had even chosen the presidential bodyguard. Some have said Amin was being groomed for power as early as 1966 (four years after Ugandan independence on October 9, 1962), but the plotting by the British and others began in earnest in 1969 when Obote started his nationalisation program. The plotting was based in southern Sudan, in the midst of a tribe that counted Amin among its members. Here, the Israel government had been supporting a secessionist movement called the Anya-Nya against the Arab-leaning Sudanese government, in an effort to divert Arab military forces from Israel's western front with Egypt during the no peace, no war period of the Arab-Israeli conflict. One of those helping the Anya-Nya was Rolf Steiner, a German mercenary veteran of several wars, who told of his time there in a book published in 1978, The Last Adventurer. Steiner said that he had been introduced to representatives of the giant Roman Catholic charity, Caritas International, and referred by them to two British men who would help him provide assistance to the Anya-Nya. They also suggested that Steiner keep in touch with a British mercenary called Alexander Gay. Little more is known about this episode except that Steiner claims that Blunden was operating an airline called Southern Air Motive, and had planned the December 18, 1969, assassination attempt on Obote. It has since been independently confirmed that Gay and Blunden were working for British intelligence, and also that Steiner found British intelligence code books at the Apollo Hotel. One of Amin's Israeli friends has spoken of his role in the coup and how he helped Amin. The friend who was a colonel in the Israel army, said that Amin approached him, saying he feared that people loyal to Obote would be able to arrest and kill him before he could secure Kampala. The friend said he told Amin that troops from Amin's own tribe in southern Sudan should be on hand, as well as paratroopers, tanks and jeeps. Bolstered by the Israeli assistance and the greater power of the Ugandan tank corps, Amin was able to overwhelm the majority of the armed forces loyal to Obote on January 24-25,1971. The Anya-Nya troops were a core of the forces in the Amin coup, and thousands of them later joined the Ugandan army and carried out many of Amin's early bloody purges which saw more than 100,000 Ugandans killed between 1971-75. The Israelis had clearly been cultivating Amin for some time through their military presence in a manner consistent with their role as US proxies. These times were the heyday of the CIA's worldwide efforts to subvert radical regimes and in Africa to assert the predominance of the US as far as possible. Active in Kenya, Ghana, Mozambique, Tanzania and Nigeria, the United States was also seeking to gain influence in Uganda, especially by means of intelligence officers of the navy and airforce based in Kampala, together with the CIA agents working under the cover of USAID. When the coup took place, Obote was attending the Commonwealth conference in Singapore. He was aware that the internal situation in Uganda was not to his advantage and went to the conference only because President Nyerere of Tanzania had impressed on him the importance of being there to help present effective opposition to the British government's arms sales to apartheid South Africa. The African members of the Commonwealth were piling the pressure on the British government. At a meeting with Zambia's Presidents Kaunda, Nyerere and Obote, British Prime Minister Edward Heath was threatened with the withdrawal of those countries from the Commonwealth should the South African arms decision go through. During this tempestuous meeting, Heath is reported to say: I wonder how many of you will be allowed to return to your own countries from this conference. After the coup, Uganda was granted 10 million pounds in economic aid (to be administered by Britain), in addition to 15 Ferret and 36 Saladin armoured cars, other military equipment and a training team for the Ugandan army. For help in this project, which was becoming an obsession, Amin then turned to Israel. He asked for Phantom jet fighters and other sophisticated weapons, permission for which would have been required from the US government. He supplied Amin with a strategic and logistical plan to the best of his abilities, and although lack of hardware was an obstacle, evidence that Amin never gave up the idea came in the fact that the invasion of Uganda by Tanzanian and exiled Ugandan anti-Amin forces in late 1978 which eventually brought his rule to an end on April 10, 1979, was immediately preceded by an abortive invasion of Tanzania by Amin's army. In the manner which characterised the major's behaviour after the Nigerian episode, he did not maintain discretion when back in England. He wanted to publish his story of cooperation with Amin in the Daily Express, but this was scotched by an interesting move by the British government -- a D-Notice banning the story on grounds of national security. Beginning with his purges of the army, later extending them to those who had carried out the purges, the ferocity and cruelty of Amin's rule increased steadily—most of it performed by the dreaded Public Safety Unit , the State Research Centre and various other bodies. These received training assistance and supplies from Britain and the US. In July 1978, the US columnist Jack Anderson revealed that 10 of Amin's henchmen from the Public Safety Unit were trained at the International Police Academy in the exclusive Washington suburb of Georgetown. The CIA-run academy was responsible for training police officers from all over the world until its closure in 1975. Security equipment of various types also found its way to Uganda from Britain, and most came as a result of the groundwork done by another collaborator of British intelligence, Bruce Mackenzie, an ex-RAF pilot and long-serving adviser to President Kenyatta of Kenya. The cargo spotlighted by the Sunday Times also included a mobile radio studio, which is almost certainly where Amin was continuing to assert over the airwaves that he was in control long after he had been ousted from Kampala. When the Liberal MP David Steel questioned Labour Party Prime Minister Jim Callaghan about this, all that the prime minister had to say was that the devices were intended to track down television licence dodgers . To add to this, it was said that after the Entebbe raid by Israeli troops, the radar damaged there was sent to England for repair. A further aspect of the Stansted shuttle involved British, US and Israeli intelligence: this was in the provision of the planes. According to the Washington Post's Bernard Nossiter, Pan Am was instructed by the CIA to sell several Boeing 707s to a New York-based Israeli company with former US defence department connections. The company was owned by an Israeli multimillionaire with a vast commercial empire. Both Israeli and US intelligence provided navigators for the planes to spy on the airfield and make reports which were shared out among Israeli, US and British intelligence agencies. The information was probably of very little use, since the Libyans almost certainly knew of the presence of the navigators on the planes. But Amin was getting a very cheap service for the coffee and tea bound for London and the other goods that returned. Washington also provided pilots for the planes. A California-based company supplied the pilots acting as a subcontractor. In general, the British government's attitude to Amin's regime was neatly summed up by The Times when Amin had just expelled Uganda's Asians on August 9, 1972: The irony is that if President Amin were to disappear, worse might ensue , The Times said. In a similar comment, exemplifying the relationship with Amin as being the devil you know , The Economist stated: The last government to want to be rid of Amin is the British one.